PARIS (AP) — Anticipating a fifth straight weekend of violent protests, Paris’ police chief said Friday that armored vehicles and thousands of officers will be deployed again in the French capital this weekend. Michel Delpuech told RTL radio that security services intend to deploy the same numbers and strength as last weekend, with about 8,000 officers and 14 armored vehicles again in Paris. A sixth “yellow vest” protester was killed this week, hit by a truck at a protest roadblock. 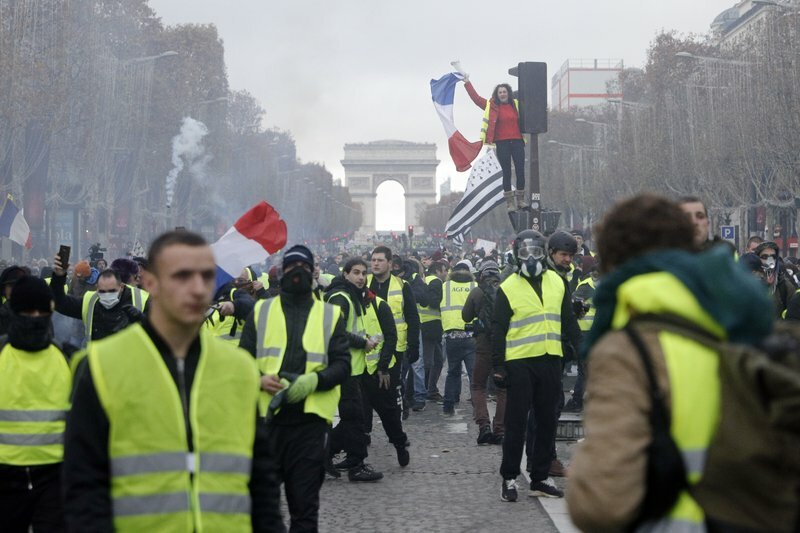 Despite calls from authorities urging protesters — who wear the fluorescent safety vests that France requires drivers to keep in their cars — to stop the protests, the movement rocking the country has showed no signs of abating. In an effort to defuse the tensions sweeping the country, French President Emmanuel Macron has acknowledged he’s partially responsible for the anger behind the anti-government protests. He has announced a series of measures aimed at improving French workers’ spending power but has refused to reinstate a wealth tax. Many protesters have expressed disappointment at the measures and some trade unions are now calling for rolling strikes across the country. French Interior minister Christophe Castaner urged protesters to express themselves peacefully in the wake of a two-day manhunt for a man suspected of killing three people in the eastern city of Strasbourg that mobilized hundreds of police. “I can’t stand the idea that today people applaud police forces and that tomorrow some people will think it makes sense to throw stones at us,” Castaner said from Strasbourg, where the suspect was killed on Thursday. Among the various calls for demonstrations, one group of yellow vests called for a non-violent protest on the Place de la Republique in Paris under the slogan “Je Suis Strasbourg” (I am Strasbourg), a reference to the “Je Suis Charlie” motto used by supporters of freedom of speech after a 2015 attack in which 12 people were killed at the offices of the French satirical weekly newspaper Charlie Hebdo.